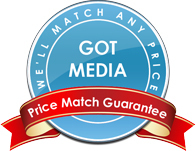 GotMedia.com is your one stop shop for all of your CMC Pro (formerly JVC & Taiyo Yuden) CD-R media needs in Orange County, CA. CMC Pro (Powered by TY Technology) has long been known as a premium manufacturer of blank CD-R. In fact Taiyo Yuden invented recordable CD technology and started manufacturing CD-R in 1988. CMC Pro (Powered by TY Technology) CD-R is made in Japan with their "super cyanine" blue dye which has been tested for data integrity beyond 100 years. Professionals choose CMC Pro (Powered by TY Technology) for stability, compatibility and reliability without question. CMC Pro (Powered by TY Technology) CD-R is sure to perform flawlessly in almost every CD recorder and player. If you are looking for a CD-R with a low error rate and compatibility that you don't need to think twice about then CMC Pro (Powered by TY Technology) CD-R will work perfectly for you. CMC Pro manufactures a full line of bulk and printable surface blank CD-R. Available in shiny silver top (bulk), White Inkjet Printable, Silver Inkjet Printable, White Thermal Printable for monocolor and color thermal printers Prism, Prism Plus, Everest, Teac P-55 and more. All Taiyo Yuden CD-R's have a faint blue hue to the record side. Please also be sure to check out our line of Taiyo Yuden DVD-R Media and CD DVD Printers products as well! We are very happy to announce that CMC Magnetics purchased the technology and manufacturing license for Taiyo Yuden optical media products. The CMC made products will be branded as "CMC Pro" and all cartons will be labeled "Powered by TY Technology". Part numbers for the CMC Pro products will be very similar to the existing JVC part numbers. CMC Pro (Formerly JVC & Taiyo Yuden) CD-R is a premium blank CDR with excellent reliability and compatibility. These CD-Rs have a white inkjet printable surface for use with a color inkjet printer. CMC Pro (Formerly JVC & Taiyo Yuden) CD-R is a premium blank CDR with excellent reliability and compatibility. These CD-Rs have a white inkjet printable surface for use with a color inkjet printer. These are hub printable which means you can print on more of the surface and closer to the center hole. CMC Pro (Formerly JVC & Taiyo Yuden) CD-R is a premium blank CDR with excellent reliability and compatibility. These CD-Rs have a silver inkjet printable surface for use with a color inkjet printer.The silver inkjet surface gives colors an iridescent look. CMC Pro (Formerly JVC & Taiyo Yuden) CD-R is a premium blank CDR with excellent reliability and compatibility. These CD-Rs have a silver inkjet printable surface for use with a color inkjet printer.The silver inkjet surface gives colors an iridescent look. These are also hub printable which means you can print on more of the surface and closer to the center hole. Taiyo Yuden CD-R is a premium blank CDR with excellent reliability and compatibility. These CD-Rs have a white thermal printable surface for use with a monocolor thermal printer. You can also write on the surface with a CD pen. CMC Pro (Formerly JVC & Taiyo Yuden) CD-R is a premium blank CDR with excellent reliability and compatibility. These CD-Rs have a White thermal printable surface for use with a color thermal printer. These are also hub printable which means you can print on more of the surface and closer to the center hole. The print surface is Everest approved. CMC Pro (Formerly JVC & Taiyo Yuden) CD-R is a premium blank CDR with excellent reliability and compatibility. These CD-Rs have a silver thermal printable surface for use with a color thermal printer. These are also hub printable which means you can print on more of the surface and closer to the center hole. The print surface is Everest approved. CMC Pro (Formerly JVC & Taiyo Yuden) CD-R is a premium blank CDR with excellent reliability and compatibility. These CD-Rs have a waterproof white inkjet printable surface for use with a color inkjet printer. These are hub printable which means you can print on more of the surface and closer to the center hole. Taiyo Yuden Watershield CD-R has a glossy finish and is smudge and water resistant after it has been printed. The print quality looks amazing! CMC Pro (Formerly JVC & Taiyo Yuden) CD-R is a premium blank CDR with excellent reliability and compatibility. These CD-Rs have a shiny silver surface for users that want to print with a monocolor thermal printer, apply a label or just simply write on the surface with a CD pen.